Lovely waterfront log cabin on desirable Little Squam Lake in Holderness. Quaint and comfortable this is the perfect getaway for your summer vacation. Comfortably sleeping 7 with 3 bedrooms, this sweet cabin will delight you! Incredible sunsets and amazing views at this adorable 2 bedroom waterfront house in Meredith at Spindle Point. Relax on the screened porch and watch the boats go by, or swim from the dock. Anything you choose to do will be a memorable experience. Wonderful waterfront home located in Moultonborough on Lake Winnipesaukee. Sandy beach, amazing views and room for your group of 8. Thinking of the perfect waterfront vacation? Think no more, as this is the spot for you! This Lake Waukewan lakefront cottage comes complete with private beach an ten minute walk from downtown Meredith.This 2 bedroom, 1.5 bath sleeps 4 and is perfect for a couple or small family and has queen in one room and 2 twins in the second bedroom. Wonderful vintage Gilford home on Lake Winnipesaukee. Amazing views and a large sandy beach! The main house has 3 bedrooms and 2 baths. The guesthouse has 1 bedroom and bath with laundry for your convenience. Beautiful Lake Winnipesaukee waterfront home in a prime Gilford location. Open concept main floor with large windows overlooking the lake. Enjoy the beautiful water views from the open deck or the large, private u-shaped dock that can accommodate up to a 30′ boat. Come enjoy this amazing waterfront home in Meredith, NH on Lake Winnipesaukee. There is enough space for 10 people to enjoy the private natural shoreline with a dock for your boat and amazing views from all over the house. Lake Winnipesaukee-cozy waterfront cottage! This 2 bedroom cottage is one of our most popular properties in Moultonboro Bay! Situated slightly above water level providing a wonderful view of the lake and mountain range in front of you. 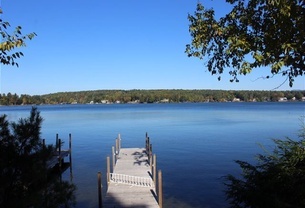 Great waterfront family rental cottage located on Lake Winnipesaukee in Gilford. This home sleeps eight people and has a 26 foot crib dock as well as two kayaks, a three season porch and an open air deck. Lovely studio cottage perfect two located at the lovely Varney Point in Gilford! Enjoy the beautiful views of the Lake or swim only a short distance away at famous Gilford Beach! Extended deck to enjoy the ALL DAY sun on Lake Winnipesaukee...a beautiful 3 bedroom, 2 + 3/4 bath waterfront home includes a full size family room. Spend a week at "WeSeekANook" and you'll never want to go home! This awesome water front vacation home on Lake Winnipesaukee has all the charm and modern updates you could wish for Close to Meredith yet far enough away to escape it all. Your quintessential New Hampshire vacation awaits at this beautiful Lake Winnipesaukee compound in Meredith!